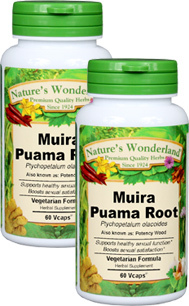 Muira Puama Capsules - 425 mg, 60 Vcaps™ each (Ptychopetalum olacoides) - Penn Herb Co. Ltd. Experience the exciting solution for heightened satisfaction, desire and performance! Muira Puama is the popular South American herb now used worldwide to safely restore sexual energy and supports healthy function. In traditional Brazilian herbalism, Muira Puama has a long history of use, primarily to boost vigor in both men and women. It’s now the herb of choice for couples that want to maintain and rekindle their passion. NOTE: Muira Puama may be a better alternative for those who can’t use Yohimbe. Choose from our wide selection of Muira Puama preparations: loose herb, premium vegetarian capsules or quick-absorbing liquid extract. COMMON NAMES: Liriosma ovata, Marapama, Marapuama, Potency Wood, Potenzholz. Supports healthy function; helps restore vigor & performance; boost satisfaction; supports nervous system function; eases stress; promotes positive mood. As an addition to the diet, take 1 or 2 capsules three times daily with water at mealtime. SF111297 Muira Pauma Root Ptychopetalum olacoides S. Amer.